The Bushnell Trophy Cam Aggressor Low Glow Trail/Game Camera is one of the cameras making their name in the market for the quality video it captures, the settings it has specialized for night sceneries and the adjustable features it comes with. This camera lets its users see the Wild through crystal clear lenses, high resolution– both in broad daylight and the night time and excellent outputs in frozen and moving states. Being a camera aiming to offer the best-captured images and movements, the Bushnell Trophy Cam Aggressor Trail Camera is made out of a hard and tough outer covering that blends quite well with the trees in the wild. It offers the option to remove the anti-reflection cover to make it less noticeable for thieves and animals alike. This hunting camera can withstand extreme weather conditions in the wild, leaving users with a worry-free experience in recording and capturing everything in the wild. It can also withstand rain and snow and not that much affect the quality of the photos or videos that will be shot in such conditions. 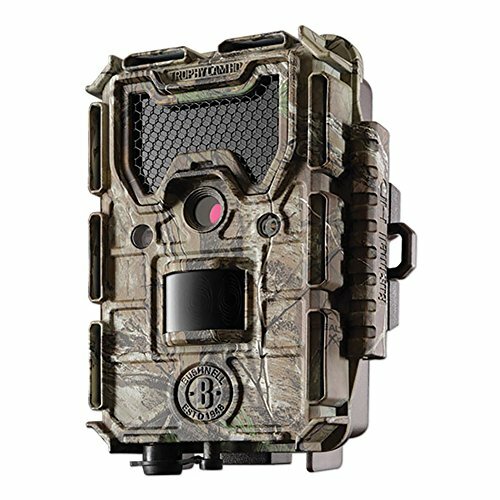 The Bushnell Trophy Cam Aggressor Trail Camera captures the events of the wild through its 14MP resolution, offering users with a high-quality 1080p by 1920p video footages with excellent quality audio and pictures. Users may capture anything with this camera at the trigger speed of 0.2-seconds, leaving all the possibilities of blurred photos behind. After taking pictures at this rate, you can already take another picture after just 1 second. Its Passive Infrared Sensor or PIR sensor can be adjusted to different settings such as low, medium, high and automatic. It also has a Field Scan setting which enables users to capture images at intervals from one minute to one hour within two separate time frames. Four pieces of AA batteries are required to let this camera function and can hold a memory card with the capacity of up to 32GB. You can also use eight pieces of the said battery, to maximize its usability for up to one year. This camera is also characterized by its night video flash which is of 36 LED and can still clearly record photos and videos 60 feet away from it. On top of that, you can also keep note of the day, date, time and temperature and moon phase to help users with further information on field observations. Users may also utilize its latitude and longitude input, which they will find handy in tracking game movement and recording camera placement. With its night video flash and the HD video, it can capture, users can record and observe even in the dark without compromising the accuracy and quality of the videos and pictures. Given that many fascinating animals and animal activities in the wild happen in the wild at night time, this will give users the opportunity to register such events without having the darkness interrupt or lower the quality of videos. Being one of the hunting cameras in the market with the fastest trigger speed, it offers the opportunity for the user to capture even the most rapid happening (e.g. an animal running, birds catching their prey, brawls between animals, etc.) without worrying about the quality of the resulting photo. The stamps in the resulting images and videos stating the day, date, time, and temperature will serve as a helping tool for those who are into serious business in documenting the wildlife– as these set of information are most of the time crucial to studies, researches and observations conducted. Its color which blends with the trees and its size (which can be gripped by the hand), it can offer users with the best angle or spot in tracking life in the wild without having to disrupt it or even be noticed by its inhabitants. Its 36 LED feature will also make it less noticeable for the animals living in the Wild, as it is not too bright for them to notice and not too dim for you not to be able to capture anything through the camera. The 60-feet distance capacity of the camera’s night mode can be quite short distance, especially when a large area in intended for study through photographic and video documentation. As much as it can capture sounds, it will already produce a low-quality visual representation once the subject goes beyond the allotted distance. Many recent studies of the Wild had its eye on the nocturnal creatures and the night hunting activities of animals, and if that’s where you will use this camera, it will not be that much of good use. Considering that the camera documents high-quality videos and photos, it is inevitable that the memory it will occupy will also be large. Given its capacity of holding a memory of 32GB, there are somewhat limits as to how many documentations you can keep. In case you have so many photos to take, you will have to have a separate gadget (a laptop or another USB or memory card) to keep a record of the images you had and still document more. With its high-resolution photographs and videos, wildlife has never been in clear image as it was before. And given its sturdy outer cover and the convenience it offers, worries about your camera getting noticed and destroyed by the natural inhabitants of the wild are left behind. Though its limit in the night vision scope provides a disadvantage, budding wildlife videographers and photographers of the wildlife can make use of this product, as studies and limits will not be as demanding as the professional’s job. Also, this disadvantage will offer an advantage to those who are not into documenting the wild at night– and will also work as a bonus feature for them.